The purpose of the Federal Motor Vehicle Safety Standard No. 205 is to "reduce injuries resulting from impact to glazing surfaces, to ensure a necessary degree of transparency in motor vehicle windows for driver visibility, and to minimize the possibility of occupants being thrown through the vehicle windows in collisions." Different parts of a windshield must be subjected to various temperature and UV radiation extremes to test whether there is any separation of materials or change in luminous transmittance. A windshield may not have less than 70%1 luminous transmittance before or after transmittance. There are several tests designed to test the resiliency and effectiveness of the laminate involving small, heavy balls dropped from heights. The visibility standards govern clarity and refraction of the curved and straight portions of the windshield, and are very strict to the extent of refraction in the glass. Various states have laws regarding the transparency of automobile glass. In Florida, windshields are not allowed to have reflective tinting which concurs with Federal Motor Vehicle Safety Standard No 205. This standard requires that a windshield have at least 70 percent light transmission. Also, as stated by Florida State Statute 316.2955: "(2) Every percentage measurement required by ss. 316.2951-316.2954 [the regulations delineated above] is subject to a tolerance of plus or minus 3 percent." The legal meter used to measure visible light transmission as well as reflectivity by local and state police can be purchased from several companies . 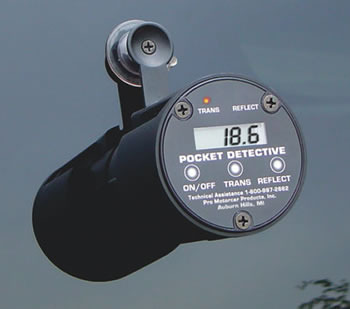 An example of this meter is the "Pocket Detective Window Tint and Reflectivity Meter" by PromotorCar Inc which is handheld and powered by batteries.